An amazing way to enjoy a fresh, delicious margarita! This easy Pineapple Margarita recipe is just 5 ingredients and comes together in moments. 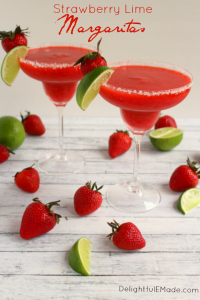 Fabulous for your next happy hour or celebrating Cinco de Mayo! Are margaritas your cocktail of choice? You’re definitely not alone. Margaritas, when mixed properly and with good ingredients, can be an amazing cocktail. 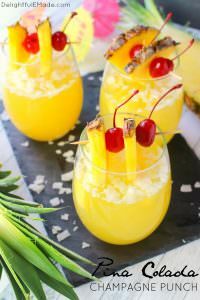 This Pineapple Margarita recipe is a fantastic spring and summer drink and amazing as an outdoor cocktail. 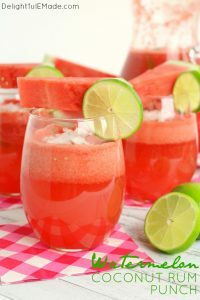 These are also fantastic for Cinco de Mayo, and a must-have beverage anytime you’re enjoying Mexican food. With the addition of pineapple juice and fresh pineapple wedges, this cocktail is nothing short of spectacular! 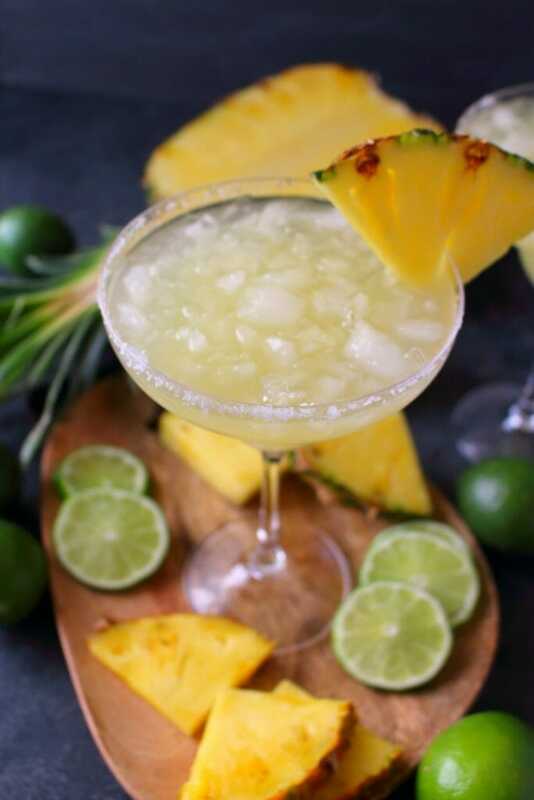 Not overly sweet or syrup-y, this Pineapple Margarita has just the right amount of lime-citrus, paired with the pineapple flavors that make it really stand out from something you would otherwise make with a mix. 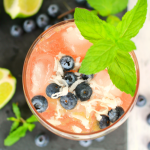 With a fair amount of tequila, this cocktail has some kick – it’s not for the faint of heart, but a definite must for every margarita lover! A key aspect to making this cocktail ultra-refreshing is to have the ingredients VERY cold. Start with filling a cocktail shaker with ice. If you can, have your ingredients chilled before making the drink as well. 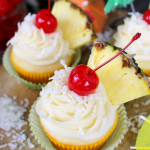 What are the ingredients I need to make a Pineapple Margarita? Tequila – I like Herradura, (gold or silver) but any good quality tequila will do. Cointreau – this is a citrus liqueur that adds delicious flavor to any margarita. Lime Juice – for a margarita, I always recommend fresh-squeezed. Don’t buy the bottled stuff – it’s just not the same. If you’re making these margaritas for a party or get-together, juice your limes in advance and refrigerate. 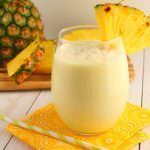 Pineapple Juice – feel free to use canned or bottled pineapple juice. Optional ingredients: Fresh pineapple slices and kosher salt for rims of glasses. 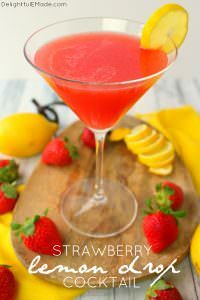 If you love a great tequila cocktail, check out my recipe for a Strawberry Tequila Sunrise over at Real Housemoms. Before mixing the cocktail, prep your glasses. 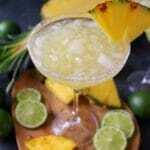 Start by running a lime wedge around the rims of the glasses, and then dip the glasses in kosher or margarita salt. Slice up some fresh pineapple and add a wedge to the rim of each glass for a pretty garnish. Additionally, fill the glass(es) with crushed ice. What type of glasses are best for margaritas? The standard glass for a margarita is an up-style, curved margarita glass. However, rocks-glasses are practical and just as effective for imbibing a delicious fresh-squeezed margarita. These are also easier to rim with lime and salt. 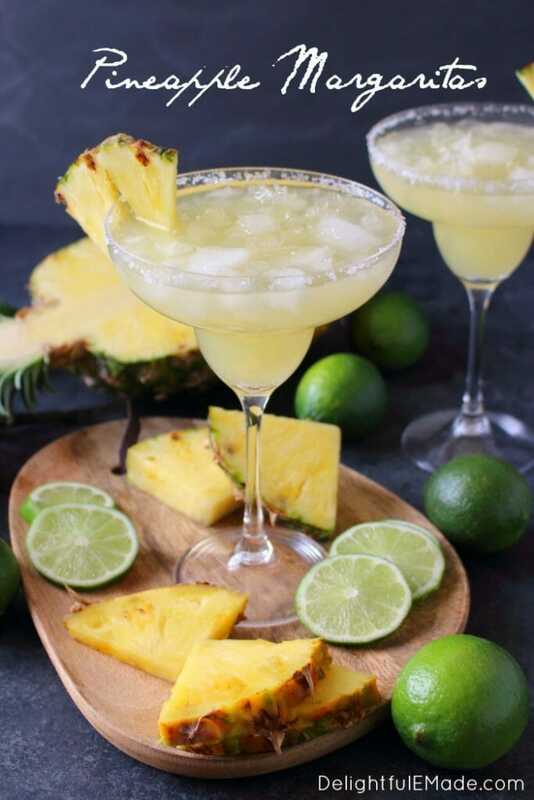 Now that your shaker and glasses are ready, simply pour in the tequila, Cointreau, fresh lime juice, and pineapple juice to the shaker filled with ice. Secure the lid to the shaker, and mix vigorously. 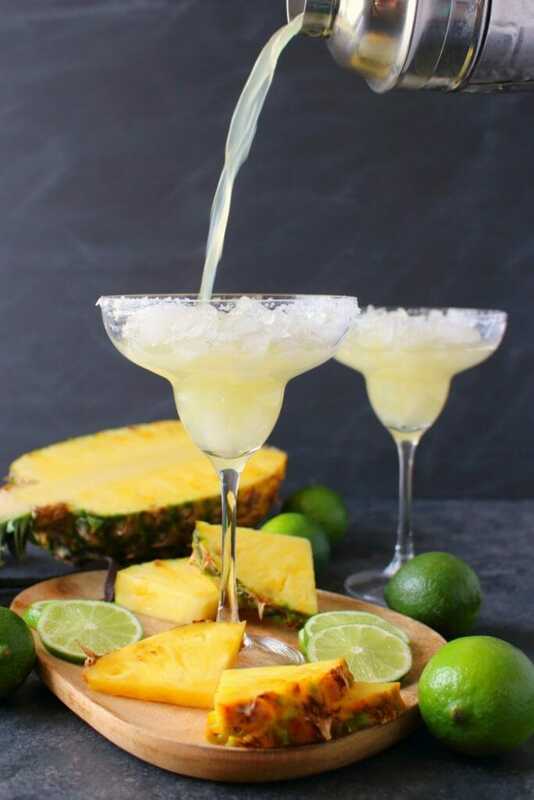 Pour into the prepped glasses, and enjoy these amazing Pineapple Margaritas right away while cold. I like a Frozen Margarita. 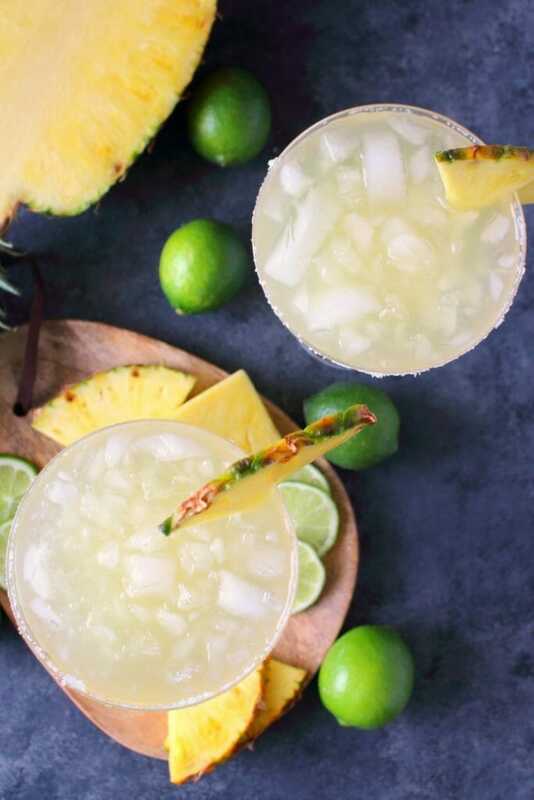 How do I make this Pineapple Margarita recipe frozen? 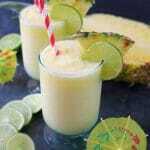 For a frozen pineapple margarita, simply add ice to a blender. (Approximately 6-8 cubes of ice per drink). Add the same ingredients to the ice, and blend until ice is completely crushed and smooth. 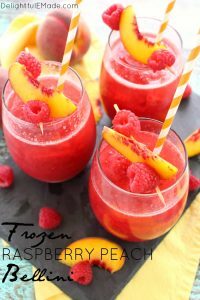 Pour the blended drink into prepared glasses and enjoy! These are the perfect drink to sip on a warm day, with your friends out on the patio and especially on Cinco de Mayo. Amazing with a Classic Pico de Gallo Salsa and/or my Loaded Guacamole and your favorite tortilla chips. 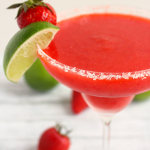 Do you love a great margarita, but with less calories and sugar? 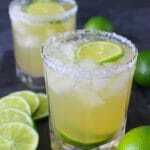 Be sure to check out my post for How to Make a Skinny Margarita! In a cocktail shaker filled with ice, add the tequila, Cointreau, lime juice, and pineapple juice. Secure a tight fitting lid, and shake contents vigorously. Optional: run a lime wedge around the rim of glass, and dip into salt. Add pineapple wedge for garnish. 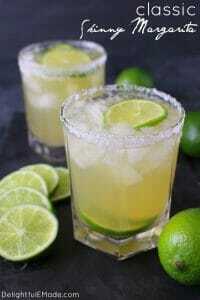 Pour margarita into glass and enjoy right away while cold. 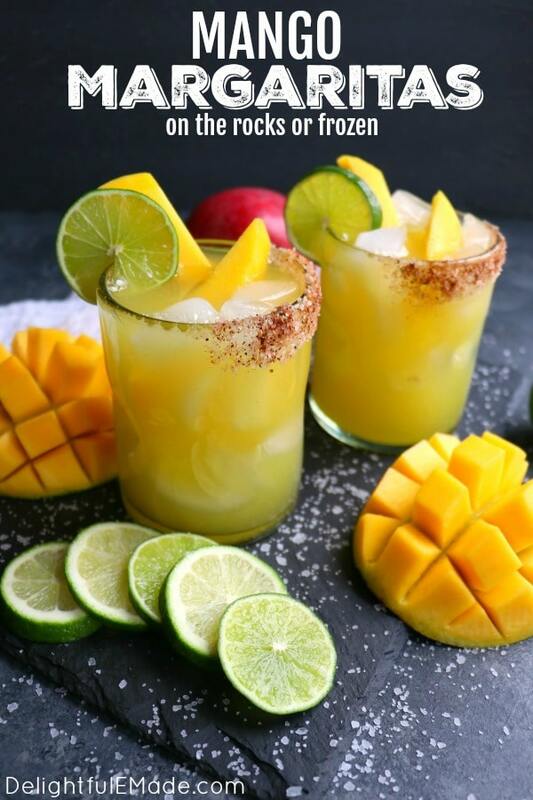 For a frozen/blended Pineapple Margarita: simply add ice to a blender (approximately 6-8 ice cubes per drink), add the ingredients, and blend until the ice is completely crushed and smooth. Pour into prepared glasses. This drink sounds so delicious and refreshing. Now I can't wait for our first deck party! 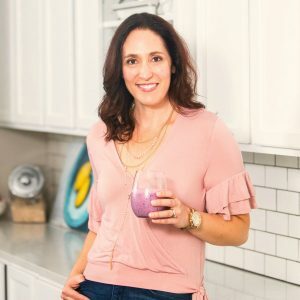 This will be a delicious drink to serve - Thanks for sharing your great recipes at the What's for Dinner party. Thanks for another tasty drink recipe. Pinned.